I had no intention of writing a series. Norwegian by Night was Sheldon's story about his son and was a singularity; it was not intended to lay a foundation or start a wider journey. It was a story about an old man's final adventure and his reconciliation with his own past. The notion — at the time — of bringing that story forward seemed to be a denial of its very end and therefore a failure to grasp or accept the nature of the story of itself. Sheldon's journey was over. That much was certain. I moved on to The Girl in Green. A new universe with new characters and a new sensibility. It opened a wider literary world for me to explore and presented a new canvas for storytelling. If Norwegian by Night was largely Sheldon's book, here I wanted an ensemble cast, playing off each other, and creating drama through their interaction, set against a world that was forcing their hands. This was a story set in Iraq. A book about war and peace. I built on my compulsion to write both comedy and tragedy and I gave deference to my instinct to see the absurd and bring it to life. It was a sweeping novel grounded in a decade of knowledge and research and travel and passion about my subject. I'm very glad I wrote it. When it was over, though, I needed to step way, way back from that world, take a breath, and consider where I was — emotionally, mentally, professionally. Returning to the world of Norwegian by Night was a gentle temptation at that point. I loved the mood and the characters and the family drama of that book, all set inside a simple crime story. I was hostile to the idea, though, of creating a lesser version of that book. I wasn't going to create a story to compete with it and lose. I needed a story that was — in essence — a book to stand alone; a novel that turned a page; that could serve as a companion to Sheldon's story but not exist in its shadow. I needed to see the world new again in the way that Sheldon saw Norway and Europe. That last part was a clue. Sigrid Ødegård was the Norwegian police chief in that first book. She already had a relationship with her father that I thoroughly enjoyed and I had made reference to a brother who had moved to America years ago. We also knew she'd lost her mother to cancer as a child. What if Sigrid went to America, mirroring — but not duplicating — Sheldon's trip to Europe? A woman and not a man; a different generation; an utterly difference life experience; and yet an encounter with a foreign culture and an adventure to be had there that echoed across time and space and literature? What adventure? What would happen? Her brother. What about her brother? He's missing. We know he's missing because something has changed. He is … unresponsive. So what? Why is this worrying? Because the father is worried. Their dynamic is complex and rooted in a painful history for which no one is to blame but in some way, everyone is. He's also worried about Sigrid. He thinks she's going to brood now. He wants her to land on her feet and start moving again. Still, though, this wasn't enough for me. A missing person case wouldn't give the novel the depth and dimensionality and present-mindedness that drives my writing. There had to be something about Sigrid's own experiences that would inform the way she approached the world itself at that moment in time. Something that would provide the optic for her concerns and investigation on foreign soil. What was happening in the real world around me that was on my mind and I wanted to seize and amplify and look for answers? Black men – black children – were being gunned down by the police on video, on Facebook, on camera. Ferguson was happening. Philando Castile was happening. I could list names, on and on. Police violence, rising racism, the national elections coming up. Black Lives Matter. A resistance to that grounded in … what? There was a connection there below the surface that would open the idea for the story itself. It was when I remembered the simple fact that Sigrid had shot an immigrant at the end of Norwegian by Night that the pieces started to fit together. Scandinavian crime writers would have us think that the culture up here (I live in Oslo) is dark and foreboding, and violent and drunk. It's dark during the winter all right, but it has one of the lowest violent crime rates in the world; the police are well educated and hardly trigger happy; and while there is a rash of petty crime (the bastards stole our baby stroller … I mean, honestly), this is closer to Pleasantville than Gotham. That doesn't sell books but it's the truth and I like building stories out of the truth; There's just so much to work with and the path it weaves into our hearts can be that much deeper. What view of life and police work might Sigrid bring to America, I wondered, having just shot and killed an immigrant once she learns that Marcus is missing because he's implicated in the death of his girlfriend — an African-American academic and scholar in race relations and identity politics? A different one, that's what kind. American by Day is the story I did not expect to write, creating the series I had no intention of writing, and yet one that has taken me on a related but unique journey back to a land I came from and I thought I knew but is becoming more strange to me every day. 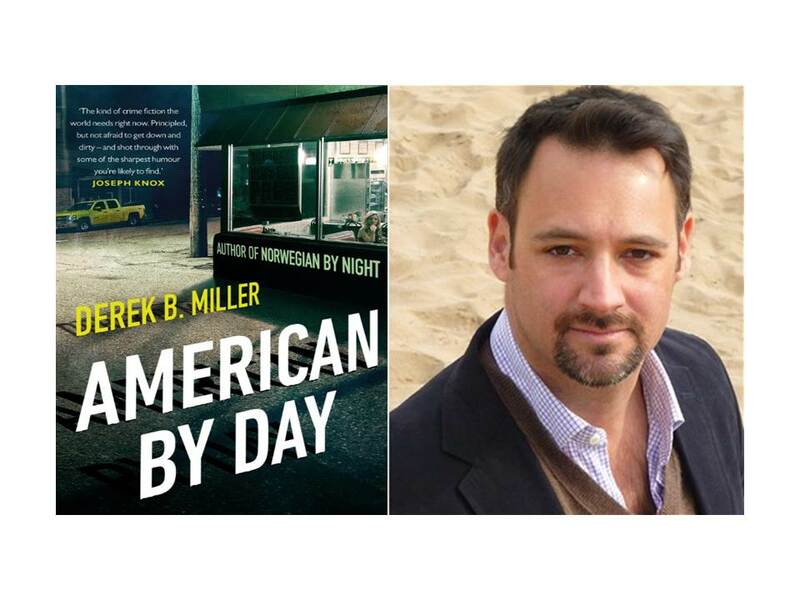 Derek B. Miller is a novelist and international affairs professional. He has worked at the UN, think tanks, and universities on matters of international peace and security and development.